ChannelPro is proud to offer these workshops for integrators looking to improve their business -- SAVE BIG by signing up for both of our workshops! When: May 7, 2018. Registration opens at 12:30pm. Workshop runs from 1pm to 4pm. Admission: $199 fee covers the workshop, snacks, all course materials, parking, plus entry in prize drawing. All paid workshop attendees on May 7th also receive a free pass to the ChannelPro SMB Forum on May 8, 2018, at the Westin Baltimore Washington Airport. Register for BOTH the Marketopia and Karl Palachuk workshops and save big. REGISTER NOW. This intensive training workshop delivers a barrage of real-world sales and marketing techniques proven to help you generate more leads, more sales and more profit. Created with the needs of MSPs, VARs and CSPs in mind, the 4u2grow Roadshow delivers training, workshops and discussion panels by some of the leading minds in the industry. Claiming more than your fair share of the market. When: May 7, 2018. Registration opens at 3:30pm. Workshop runs from 4pm to 7pm. Who Should Attend: Any IT service provider who needs to break through to the next level of revenue and profits. Having the right sales and marketing techniques is vital to making this happen. Admission: $199 fee covers the workshop, snacks, all course materials, parking, plus entry in prize drawing. 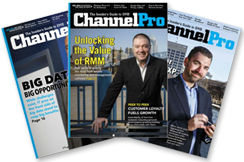 All paid workshop attendees on May 7th also receive a free pass to the ChannelPro SMB Forum on May 8, 2018, at the Westin Baltimore Washington Airport. Register for BOTH the Karl Palachuk and Marketopia workshops and save big. REGISTER NOW. Book directly within the ChannelPro SMB Forum group room block by CLICKING HERE or dial (443) 577-2300 to make your reservations by phone. Be sure to reference the ChannelPro SMB Forum group when you make your reservation to receive the discounted room rate. The Westin Baltimore Washington Airport - BWI. Escape the stress and exhaustion of travel and find relaxation at this luxurious contemporary hotel. As the nearest four-star hotel, we are the top choice when traveling through Baltimore-Washington International Airport. The hotel is located in the BWI Hotel District, approximately 2.1 miles from the airport, with shuttle service to and from the hotel. Our ideal location in the heart of the Baltimore-Washington corridor is just minutes from downtown Baltimore and the Inner Harbor, and a quick drive from myriad local attractions as well as Annapolis and Washington D.C. Corporate and government travelers will have easy access to offices such as Northrop Grumman and the National Security Administration. Retreat to one of 260 spacious and superbly comfortable guest rooms. Each room includes the amenities necessary for total respite: a flat screen television, our signature Heavenly® Bath, and the Heavenly® Bed, with a custom-designed pillow-top mattress, fresh linens, and chic white comforter. For added elegance, select the Executive Level. You’ll enjoy additional amenities as well as complimentary breakfasts and hors d’oeuvres. Awaken your body with a workout in our WestinWORKOUT® Fitness Studio, complete with cardiovascular and free weight equipment, or take a refreshing swim in our glass-enclosed pool. And for a truly unique dining experience, dine at Luminous Restaurant & Lounge. Our welcoming staff truly inspires creativity. The Westin Baltimore Washington Airport - BWI boasts more than 10,000 square feet of flexible function space. Our Executive Boardroom with state-of-the-art teleconferencing and audiovisual equipment will serve all of your group’s needs and ensure that your meetings run smoothly. The Westin Baltimore Washington Airport Hotel offers shuttle service to and from BWI airport, the Amtrak Station, and the Business District Light Rail Station. The shuttles run 24 hours a day, and guests can call the hotel directly (443-577-2300) and ask for shuttle pickup. If guests are arriving via an in-bound flight at BWI Airport, please let the operator know which door they are located. If guests are on the lower level (baggage claim), they may be picked up in Zone 1 before Door 1 or Zone 3 at Door 15. If guests are on the upper level, they may be picked up at any door number, but must walk out to the second curb for shuttle pickup. Please allow 20 to 25 minutes for the shuttle to reach your location. 4:00pm to 7:00pm Marketopia’s 4u2Grow Roadshow Workshop! Click to play the full video "ChannelPro and the SMB Roadshow - A Chat with Michael Siggins"